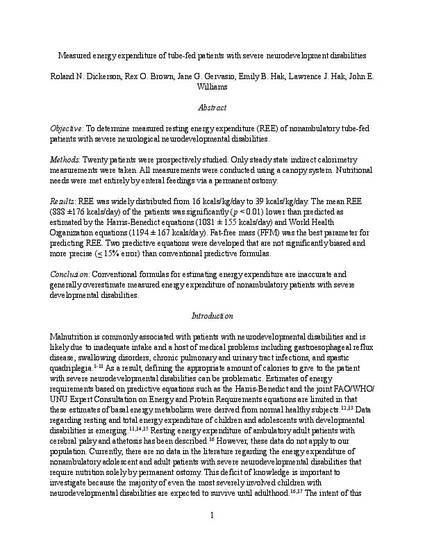 Objective: To determine measured resting energy expenditure (REE) of nonambulatory tube-fed patients with severe neurological neurodevelopmental disabilities. Methods: Twenty patients were prospectively studied. Only steady state indirect calorimetry measurements were taken. All measurements were conducted using a canopy system. Nutritional needs were met entirely by enteral feedings via a permanent ostomy. Results: REE was widely distributed from 16 kcals/kg/day to 39 kcals/kg/day. The mean REE (888 ±176 kcals/day) of the patients was significantly (p < 0.01) lower than predicted as estimated by the Harris-Benedict equations (1081 ± 155 kcals/day) and World Health Organization equations (1194 ± 167 kcals/day). Fat-free mass (FFM) was the best parameter for predicting REE. Two predictive equations were developed that are not significantly biased and more precise (≤ 15% error) than conventional predictive formulas. Conclusion: Conventional formulas for estimating energy expenditure are inaccurate and generally overestimate measured energy expenditure of nonambulatory patients with severe developmental disabilities.